As a follow-up to their Independence Day phenomenon, director Roland Emmerich and producer Dean Devlin opted to reinvent a classic Japanese film franchise with Godzilla. Under visual effects supervisor Volker Engel, the newly-formed Centropolis Effects created a twenty-story-tall digital Godzilla, supported by practical creature effects from Patrick Tatopoulos designs, plus extensive physical effects, both large and small, by Clay Pinney and Joseph Viskocil. After a five-season run, the television sensation The X-Files leaped to the big screen in a feature film produced by X-Files creator Chris Carter and directed by series regular Rob Bowman. 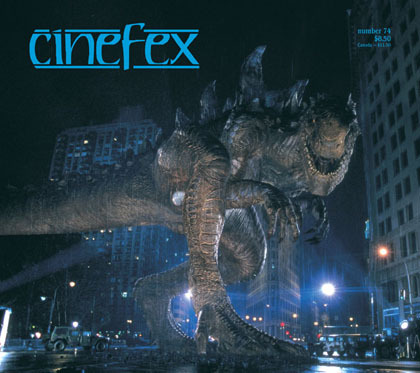 In addition to makeup and creature effects by Amalgamated Dynamics Inc., the motion picture featured an abundance of postproduction work - supplied principally by Light Matters and Blue Sky | VIFX - overseen by visual effects supervisor Mat Beck.